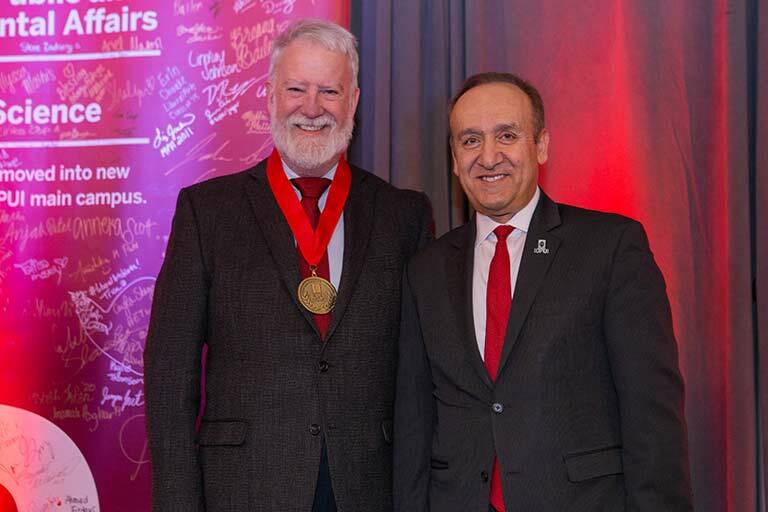 On January 24, 2019, retired IUPUI Registrar Mark Grove received the IUPUI 50th Anniversary Chancellor's Medallion by Chancellor Nasser H. Paydar. The award recognizes Grove's longstanding service to higher education and to the IUPUI campus through his significant contributions to university administration, institutional planning, and student success. Grove came to IUPUI as registrar in 1990 after previously serving as registrar at IU South Bend. As registrar, Grove served at the crossroads of the university and was known widely across campus as a valuable, trusted colleague and collaborator and source of reliable information. Grove was one of the early champions and facilitators of using enrollment data in decision making on campus and an early adopter of integration technology and use of the internet. These influences prompted transformative change at IUPUI. He and his wife Mary, who served as director of the IUPUI Passport Office, were instrumental in IUPUI's coordination with Indiana Vocational Technical College (now Ivy Tech Community College of Indiana). Grove retired from his position in 2004 and for a number of years afterward performed data analysis and developed reports for the Division of Enrollment Management. He is a champion of the campus and serves on the IUPUI History Committee, is a member and leader of Senior Academy, and a very reliable and knowledgeable volunteer and advocate for IUPUI. After retirement the Groves did some work for the university, with assignments in Kazakhstan, Kyrgyzstan, Kosovo, Liberia, and Macedonia — work performed under the auspices of IU’s Center for International Education and Development Assistance funded by the U.S. Agency for International Development (USAID) World Learning, and the Organization for Security and Cooperation in Europe.